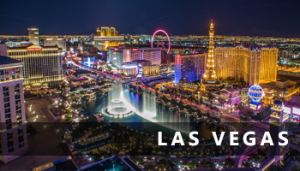 Get the best accommodation in Las Vegas, Nevada – whatever your travel budget! Las Vegas is a city like no other on this earth. Where else can you stroll from a mysterious Egyptian pyramid, looming out of the desert to Treasure Island, pass by the wonders and sights of Paris, Venice and Caesar’s Palace on the way? Las Vegas is a party city and a convention city. Hotels can be sold-out at any time of year if there is a big convention on. Generally weekends have higher rates than weeknights. With non-stop flights from Europe, Las Vegas is even a useful base for travellers wanting to see the stunning natural wonders of Nevada, Arizona and Utah. The Grand Canyon and several other outstanding National Parks are within a few hours drive. There is a huge range of hotel accommodation in Las Vegas from 5 Star luxury hotels on The Strip, to more moderate hotels amid the action of the downtown area and Fremont Street. Cheaper hotels and motels can be found a few blocks off The Strip. You will find something to fit your travel budget. Even 5 star and luxury hotels offer deals and discounts to fill rooms at quieter times. Hotels in Vegas don’t like to have empty rooms. So try our search box and choose “price” as the sort order and you will see live availability and great prices for your chosen dates and see what deals you can score for your Vegas Vacation! Las Vegas has hotels and motels every category and for every budget. Even the smallest hotels have a casino attached. The largest hotels on the strip are entertainment palaces with huge theatres and shopping malls and even an amusement park. The most impressive, luxury hotels are located on The Strip. Cheaper options are to be found just a few blocks off The Strip. Downtown, the Fremont Street area offers another alternative with moderate hotels and big party atmosphere. But the good news is that even the very best hotels can have bargain rates depending on the day of the week or the time of the year. Use our search box to find out just what is available for your dates. Sort by price and you may be pleasantly surprised to find some big name hotels with great deals. If you can be flexible with the dates, try again a few days either side. Just don’t expect deals aroun mid January when the Consumer Electronics Show brings up to 165,000 delegates to town! We find the lowest available online prices – and that’s guaranteed!